Overview : The Razer Imperator is not just a mere mouse, it is an extension of your hands. Its right-handed ergonomic form factor with a contoured thumb grip delivers comfort and a better fit for gaming, whether you use a palm or fingertip grip. Be empowered to take on foes and fatigue alike - for longer gaming sessions without strain. Quality/Usability : Although this mouse is mainly for PC/Mac and PC gaming use, this review mainly revolves around console gaming with the use of XFPS 4.0 Force for PS3 and Speed for Xbox 360. This can also be used with XFPS Rateup for PS3 and XFPS Sniper Plus for Xbox 360. The Razer Imperator's box has a cover flap and when opened, it shows the mouse behind a clear plastic box/cover. Included with the package are separate instructions for both Mac and PC, pamphlets, as well as a coaster, stickers and a seal of authenticity. The scroll wheel is fairly big and not small. The left and right buttons have a big clickable surface where your fingers and rest easily. Underneath are two more buttons that are used to adjust sensitivity on-the-fly. On the side are two thumb buttons and can be programmed. These are adjustable for those of you who have very long or very short thumbs. These are the only buttons that are adjustable. On the bottom of the mouse is a switch. As you move this up or down, the thumb buttons also move. Also on the bottom is a button labeled "PROFILE". This button is used for on-the-fly profile switching so you don't need to minimize or ALT+TAB out of your game to open the application. This button is only useful for PC/MAC use. There are some features that will not work on console games. A cool factor about the mouse is that the logo on the front/top of the mouse pulsates and lights up. It does serve a purpose or anything except for the fact that it lets you know the mouse is powered. The scroll wheel also lights up blue as well. The USB plug has a gold plated USB connector, as well as the 7 foot long braided cord which allows for greater durability. No matter what your setup is, the 7 foot of cord is long enough. Since the Razer Imperator is connected to the computer, its best that you download the software since you can use it as your new mouse for your computer. I'm not going to go through the whole process of installation and settings as its like any software install and some of the features that is used for PC game does not work for console. If you're interested in knowing more about this mouse for PC gaming, please do a search on this mouse as others have reviewed this witht he focus of using it for PC gaming. However, I will discuss some functions that will work for console game and settings. You can adjust the DPI up to 5600! That insanely high. You can also adjust the acceleration and polling rate (125Hz, 500Hz or 1000Hz), toggle whether you want the light on the logo to be ON or OFF and the same goes for the scroll wheel. The software allows you to check to see if there is any new updates if you feel your mouse is not performing well or if there is a bug. Adjusting the DPI on your computer will not have a major effect on what is displayed on your TV for your console gaming. I've tried 1800dpi as well as 5600dpi. Having it set to 5600dpi, the cursor on my mouse was zipping across the screen but in console gaming, the movement was quick but not the same to that on the computer (this was tested on XFPS 4.0). Putting it on a lower DPI, it worked and looked fine on my monitor but on my console games, it would skip and jump. So there will be some playing around to find the right setting that is perfect for you as well as your games. Using products such as XFPS Rateup or XFPS Sniper wouldnt matter as you are connecting directly to the adapter and there is no way to adjust settings. Having compared the Razer Imperator with my wireless Logitech Mouse and cheap wired DELL USB mouse, the Imperator is definitely better when it comes to slight movements since it has a higher DPI. There is no need to assign buttons or anything for console games as you'll be programming them either through the product itself or through the software provided by the manufacturer of the adapter. I loved the comfort the Razer Imperator provided. It fit like a glove and I did not have to lift my hand off the mouse to readjust. Conclusion : Overall, the Razer Imperator Gaming Mouse is a well built product. The ability to adjust the thumb buttons allows me to set it to a spot where I can comfortably rest my hand on the mouse without having to move my hand up just to reach the buttons. The click response is very good and the mouse has a very fluid movement. Using this with your computer and PC gaming gives you multiple settings and customizations that will suit your needs. When it comes to console gaming, there isn't much you can do and you're limited. But thats not the Razer Imperator's or any PC peripherals fault. Its dependent on the adapter/accessory it communicates with and console. The price however is a bit steep costing $80 but this is a 5600dpi mouse. If you're a serious gamer and competitor, its worth every penny. If you're a casual gamer I would pass and I would definitely not get this for normal everyday computer use. Majority of the features will go unused or untouched. The lights are very bright but come in handy when you're playing in the dark but if its too dark for you, you can turn them off. Would have been nice if you also had the ability to adjust the brightness. 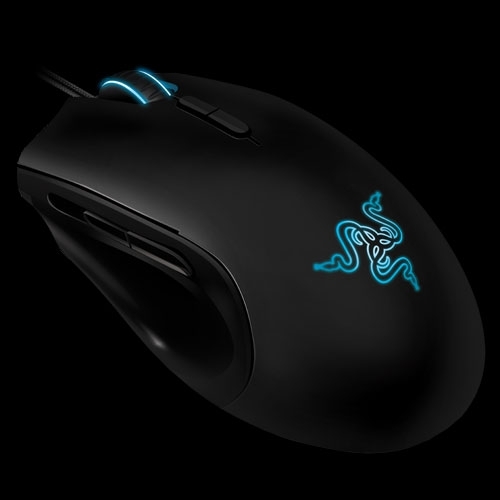 If you're a lefty, this wouldn't be for you as this is geared towards right-handers but Razer does have left handed mouses such as Razer DeathAdder (US - $59.99) or if you're in Europe (€59.99).